Hasn't RIM suffered enough? Investors don't seem to think so. According to many analysts, RIM is poised to continue their tragic plunge in value, and eventually become the next Palm, bought out by a giant like Microsoft or HP. In 2008, RIM's shares saw their peak at $148 per share. Right now, it's valued at $43.56. And analysts say that it could be as low as the mid-30s by the beginning of 2012. If so, that would make RIM a tempting, albeit expensive, acquisition for a giant like Microsoft. 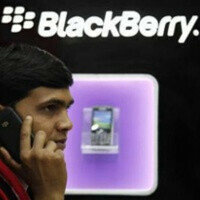 Analysts point to the BlackBerry PlayBook as one of their major attempts to rebound. But poor reviews, and reportedly meager sales have diminished their optimism. And that sheds some light on RIM co-CEO Mike Lazaridis' outbursts. If his board was telling him that the PlayBook absolutely needed to succeed, we can understand his emotional reaction. RIM's other CEO, Jim Balsillie, recently admitted that their products are aging, and promised that a new generation of high-end BlackBerry devices was on its way. But, considering the time it will take to bring those to market, investors expect the decline to continue into next year. And we consumers have both a long memory, and limited loyalty. So RIM can't expect us to be waiting for them to blow our minds in 2013. I don't think RIM will go the way of Palm cause of a few reasons, first they could make a fortune opening up BBM with advertising to iOS and Android. Sure that could cause more people to leave but I think most people who intend on leaving Blackberry have already made up their mind. On that note I think Blackberry is going to go back to being an Enterprise first device. THey'll be fine, they just won't be as awesome as they were pre-android. A more likely acquirer for RIM would be HP. HP has been making inroads into the secure computing community and a RIM acquisition would enhance their attempt to develop the secure computing branding for HP. I smell Rim/Android Devices :). Android 2.3+ would look good on a torch, touch, or storm. I have been a faithful RIM user for the last 7 years but I to am tired of waiting around. The sentence "we consumers have both a long memory, and limited loyalty" Is true. I get tired of my BB9700 not being able to display webpages as "memory is to low". "This page is to large to load" my phone is only a year old and I can't even view the internet or a email that doesn't have text. Not acceptable. The new offerings in their upcoming lineup doesn't excite me either. How come companies like HTC, Motorola etc can come out with dual core phones with high end screens and memory etc when they have less money and resources then RIM. I was a faithful Nokia fan and I watched them spiral downward while everyone was soaring. Everything you just described is essentially what Nokia did to fail and have to resort to WP7. HTC and Samsung can pump out 4 new phones per month and RIMM needs 11 months to update the processor and RAM in that ugly Torch or simply add a touchscreen to the same, exact bold they've been remaking since 2006. While Nokia will have had NO new phone offerings for 3 entire quarters. FAIL for both companies. Maybe Microsoft (who is already considering buying Nokia's mobile phone division) should purchase both RIMM and Nokia and combine them with WP7/8 into their mobile category like iApple with iOS and iStuff. RIM's biggest problem (and in my opinion, only real problem) is their extreme snail's pace at releasing new products. Their current smartphones are "aging" because they're pushing a YEAR since their last major release (Torch). I'm very excited about the upcoming phones - the touch "manza" especially - but that does me no good when it could still be several months before they're available. They missed CTIA and the other shows this year (with nothing but Playbook, Playbook, Playbook), and only "announced" one phone at their own show...5 months into 2011. They would've been better off not releasing the Playbook, at least not yet, and pushing out all of their upcoming OS 7 phones by now, with a strong focus on a QNX phone by the holidays. That would've had A LOT more mileage than the Playbook! Hey I think their stock high was $210 a share in the summer of 2007. Not sure if I would trust analysts making a definitive call like this well before RIM has expressed interest in selling. Also, it would be difficult to imagine either of the founding execs parting with the brand. easy answer. Fire the board of directors that have allowed this company to perish. Then install a new agressive board. one that doesnt scream about things being unfair and just does their job. Get QNX on new phones in 6 months. Dump the curve line and leave the bold/torch as the only keyboard options and go all touch screens. oh yea.. and make sure that all the QNX phones are 100% compatable with the android market. blackberry corperate security and email, android versatility. thats the least I would like to see.... It just stops innovation, they should get a workaround so devs get their apps ported like MS is doing with a kit for iOS apps to WP. For smartphone market, RIM had 44% market share 1.5 years ago, now it is 25%. RIM/Blackberry should continue to drop at the same rhythm as ANDROID growth. If the drop continues in the same quickness for the next 1.5 years, RIM/Blackberry should not account for more than 6% smartphone market share in 1.5 years ! For tablets, buyers mainly search to have the same OS as their smartphones, so it should not change anything. i guess this article's comments have a more accurate picture on the rise and falls of the giants ! ! RIM has really relied solely on its messenger service and email to sell devices. But now push mail is everywhere and surprise suprise someone invented WhatsApp ! Unfortunately unlike nokia they dont have the volume in the super cheap phones like nokia does esp in countries like mine- india. So a eventual sellout might not be impossible. Either they do a motorola right now or they might just have hammered the last nail to their own coffin. I think that Microsoft would be the best buyer of RIM. Is it such a good idea to combine Nokia, Microsoft, Skype and RIM into a Windows Phone in the future? I think that's a good combo! I've always loved Blackberry's, and in my own personal experiences it's been really stable (hardly any freezing, low memory, etc). They also had EXCELLENT battery life for me, but like many of you I have been dissapointed in the OS and it's become quite boring. I have used Android, WinMo (older versions and 7), and BBOS, and I have personally felt that Blackberry has fallen behind when trying to compete for people in the general consumer base. Now with that said, there are people who love the devices the way that they are and have no desire to have android features and whatnot. To each their own I suppose, but I would love to see something brand new from RIM. The main problem with RIM is their inability to adapt. They let a company like Apple and Google overpower them. They should be fighting back with BETTER or on par hardware, talking to more developers to make more and better apps to their new phones so their not left in the dust. Now, idk what their plan of action is right now but seems to me and I know alot of people agree, they should have brought out QNX on their phones NOW not OS7 or AT LEAST make their phones Dual Core with front facing cams as well just to be on par with the competition and so we the customers can upgrade down the road to QNX. If anything I'd like to see HP buy them but not Microsoft cause they ruin anything they touch, just look at the Zune- what a great product and they let it slip thru their fingers!